As man first began to lay the foundations for civiliation, he did so along the banks of rivers and on the edges of oceans. With the advent of the aqueduct, man was finally free to set down roots far from the water, knowing that these marvels of engineering were bringing water to him. And while we may have surpassed this technology in so many ways, there's still a beauty to these testaments to mankind's ingenuity. Whether flaunting a bright color or performing tricks, here are five aqueducts that have not only fulfilled life duties of supplying water, but have become world-class attractions that connects the past to the present while building bridges to the future. It is its bright red color and eagle-shape weathervane that make this aqueduct always camera-ready. During the 19th century, it fulfilled a duty of service for the San Joaquin sugar factory before it was severely damaged in the Spanish Civil War. These days, this 40-meter monumental masterpiece appears as though it is ready to take flight at any minute by the way its Mudejar-style body is carved into the Barranco de la Coladilla. Even to this day the Romans never cease to amaze us with their architectural feats that have survived the test of time; and the Aqueduct of Segovia is proof. The aqueduct is affectionately known as the Devil’s Bridge based on the legend that the devil himself worked tirelessly to create it in order capture a woman. Perchance, it is because of his magical powers that this historic treasure remains in use today. What this aqueduct lacks in youth it makes up in strength. After some 2,000 years in existence, the Pont Du Gard still stands like a mighty giant towering over the Gardon River. 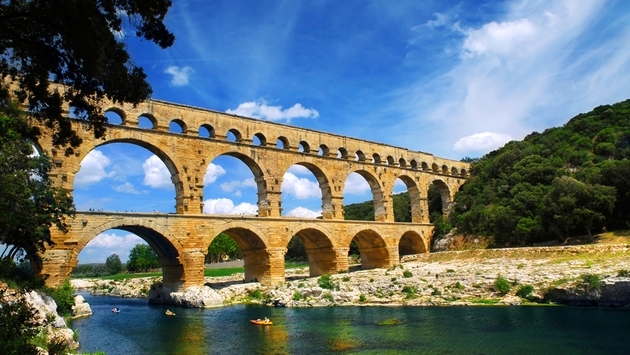 During its heyday, water was transported to Nimes from Uzes via the Pont Du Gard. These days, it is used as a bridge for automobile traffic. Now it is a pleasant sight that radiates in antiquity and offers the best views of the flowing river and a museum located at the entrance. The Barton Swing Aqueduct may not be as historic as the others, but it definitely plans on making history as a cool, innovative apparatus. It is the only aqueduct that has the ability to move in order to let passing ships navigate along the Bridgewater Canal successfully, yet allowing smaller boats to glide along its top. In the world of waterways, the Barton Swing Aqueduct reigns supreme since 1873 because it does more than the ordinary; it pivots majestically too.